Six Crook County High School athletes chose to spend the final weekend of their spring vacation competing in a grueling multi-event track competition at Summit High School. The annual event, which features a decathlon and heptathlon, attracts multi-event track athletes from throughout the Northwest. This year's competition had 48 boys and 25 girls take part. Of the 48 who started, just 42 boys completed the event, while all 25 girls finished the heptathlon. Arthur Katahdin of Milwaukie High School amassed 5,958 points to run away with the championship of the 10-event decathlon, while South Eugene's Taylor Chocek won the girls seven-event heptathlon with a score of 4,217. Katahdin, a junior, is well known nationally in the decathlon after winning the 15-16 age group at last year's USATF National Championships in Greensboro, North Carolina. He led a group of three athletes to score enough points to qualify for this year's national championships, which will also be held in Greensboro. Churchill's Simon Dexter and Turner Nye of North Medford also qualified for the national event with scores of 5,457 and 5,431, respectively. Chocek was the lone girl to qualify for nationals in the heptathlon. The events in the decathlon include the 100-meter dash, long jump, shot put, high jump and 400 meters on the first day of competition. The second day of the event sees athletes compete in the 110-meter high hurdles, discus, pole vault, javelin and 1,500-meter run. The heptathlon starts with the 100-meter hurdles, high jump, shot put and 200-meter dash on day one. Day two concludes with the long jump, javelin and 800-meter run. Both events assign a point value in place of time or distance, with athletes accruing points based on how their performance compares to a standardized table. Ashton Eaton, who graduated from Mountain View High School, officially holds the world record in the decathlon, scoring 9,045 points at the IAAF World Championships in 2015. However, Kevin Mayer of France eclipsed that mark at the Decastar in Tulance, France, in 2018. His mark is pending ratification by the IAAF. Meanwhile, the world record in the heptathlon was set by Jackie Joyner-Kersee of the United States at the summer Olympics in Seoul, South Korea, in 1988. When the spring break multi-event moved to Summit High School in 2015, 13 girls and 15 boys competed. The event has grown annually since then. Crook County's Noah Chaney was the highest-placing Central Oregon boy, placing seventh overall with a score of 4,886, 23 points better than he did last year, while finishing fifth at the event. Redmond's Erin Wanamaker was the highest-scoring Central Oregon girl, placing 12th overall with a score of 2,402. Other Crook County athletes to complete the event included Jason Slawter, 33rd in the decathlon with a score of 3,511, and Elijah Becker, 37th with a total of 3,198 points. Cameron Whitney and Isaac Logan also started the competition but did not complete the event. Whitney dropped out during the first day of competition, while Logan completed every event except for the 1,500-meter run. Aubrey Love was the lone Cowgirl to compete in the heptathlon, placing 18th overall with a score of 2,080. Katahdin won three individual events in the competition, taking first in the pole vault, 110 hurdles and shot put, while Summit's Jack Normand won both the high jump and long jump. No other competitor in the decathlon won more than one event. Tanner Nauta of Molalla started the competition off with a win in the 100-meter dash with a time of 11.31. Chaney was the top Crook County performer in the event, taking 21st with a time of 12.17. Becker was 23rd in 12.28, while Slawter was 26th with a time of 12.31, Whitney 36th in 12.99, and Logan 48th in 14.20. Normand's leap of 6.55 meters (21 feet, 6 inches) took first in the long jump by just over an inch. Becker finished 17th with a leap of 5.41 meters, Slawter 21st, 5.322, Chaney 24th, 5.14, Whitney 42nd, 4.49, and Logan 44th, 4.38. Katahdin's heave of 12.61 meters (41 feet, 4.5 inches) easily won the shot put. Slawter was 13th in the event with a toss of 10.65 meters, while Becker was 29th, 9.22, Chaney 31st, 9.00, Whitney 40th, 8.16, and Logan 44th, 7.83. Normand's winning clearance in the high jump was 1.98 meters, approximately 6-06, far ahead of the second-place leap by Skyler Larson of Sisters, who cleared just over 6-01. Chaney and Whitney tied for 28th in the event with leaps of 1.47 meters, while Becker, Logan and Slawter failed to clear a height. In the final event of day one, Sweet Home's Casey Tow won the 400 with a time of 52.17. Chaney placed ninth in the event with a time of 54.92, while Slawter was 26th in 57.93, Becker 36th with a time of 1:02.05, and Logan 46th in 1:14.64. Whitney scratched out of the event. Day two started with Katahdin and Nye running exactly the same time in the high hurdles, finishing in 16.09. Becker had his best finish of the meet in the hurdles, placing 10th with a time of 18.01. Chaney finished in 15th with a time of 19.14, while Slawter was 39th in 32.27, and Logan was 44th with a time of 25.92. Redmond's Gage Garner easily won the discus, heaving the platter 38.42 meters (126-06), nearly 3 feet better than second-place Katahdin, 37.73 meters. Chaney finished 19th in the event with a toss of 25.45, while Slawter was 26th, 23.18, Logan 35th, 19.58, and Becker 40th, 18.21. Katahdin cleared 4.26 meters (approximately 14 feet) to win the pole vault, while Chaney was second with a clearance of 4.11 (13-6). Slawter tied for 12th with a leap of 3.05, while Becker was 23rd, 2.59, and Logan 38th, 2.28. Slawter won the javelin with a season-best throw of 48.72 (159-10), while Chaney was 19th, 36.13, Logan 35th, 27.98, and Becker 39th, 26.73. In the final event of the decathlon, Dakota Glover of Estacada won the 1,500 with a time of 4:45.65. Chaney finished third in the event with a time of 4:47.21, while Slawter was 42nd in 6:58.61, and Becker was 44th with a time of 6:58.64. Chocek won four of the seven events in the heptathlon, while Molalla's Kate Sandberg won two. Chocek started the meet off with an impressive win in the 100 hurdles, winning by more than a second in 15.41. Love finished 16th in the event with a time of 21.66. Chocek continued to excel in the high jump, taking first with a leap of 1.60 meters, (nearly 5-03), 3 full inches ahead of second place. Love tied for 19th in the event with a leap of 1.17. Sandberg won her first event in the shot put, with a heave of 10.54 meters (34-07), nearly 3 feet ahead of the second-place performer. Love finished in 21st with a toss of 5.63 feet. Day one closed with the 200, which was won by Chocek with a time of 26.69. Love finished in ninth place in the event with a time of 30.22. Chocek started day two the same way she finished day one, winning the long jump with a leap of 4.89 (16-00.5). Love finished 22nd in the event with a leap of 3.51. Sandberg then picked up her second win of the event, taking first in the javelin with a throw of 31.54 meters (103-06), while Love was 19th with a throw of 13.86. The 800, the final event of the heptathlon, was won by Emily Jensen of McMinnville, who completed the two-lap event in 2:30.17, more than 2 seconds ahead of the field. Love finished in seventh place in the event with a time of 2:44.33. 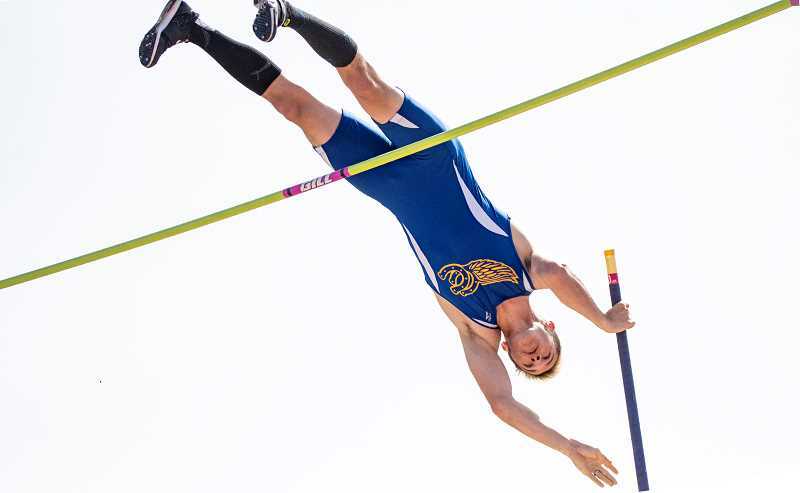 The Summit Decathlon-Heptathlon is the only opportunity for most multi-event athletes to compete until after the state meet, which will be held Memorial Day weekend. Regular track meets began again on Wednesday as Crook County competed in a three-way meet at Bend Senior High. The season continues today with Crook County competing in the Laker Classic Invitational at Lake Oswego High School. 100m Hurdles - 33" — 1. Taylor Chocek, Unattached, 15.41. 2. Brette Graham, Lakeview, 16.88. 3. Elizabeth Grandle, Molalla, 17.85. 4. Bella Sallee, Unattached, 18.46. 5. Kayla Morgan, Southwest Christian, 18.74. 6. Erin Wanamaker, Redmond, 18.87. 16. Aubrey Love, Crook County, 21.66. High Jump — 1. Taylor Chocek, Unattached, 1.60m. 2. Kayla Morgan, Southwest Christian, 1.50m. 3. Sarah Phillips, Molalla, 1.45m. 3. Elizabeth Grandle, Molalla, 1.45m. 5. Makenna Chapman, Central Linn, 1.40m. 5. Madison Chapman, Central Linn, 1.40m. 5. Julia Ketcham, Lakeview, 1.40m. 19. Aubrey Love, Crook County, 1.17m. Shot Put - 4kg — 1. Katie Sandberg, Molalla 10.54m. 2. Madison Chapman, Central Linn, 9.64m. 3. Taylor Chocek, Unattached, 8.73m. 4. Jasmyn Clark, Santiam, 8.13m. 5. Erin Wanamaker, Redmond, 8.04m. 6. Elizabeth Grandle, Molalla, 7.82m. 21. Aubrey Love, Crook County, 5.63m. 200 Meters — 1. Taylor Chocek, Unattached, 26.69.2. Sarah Phillips, Molalla, 27.73. 3. Julia Ketcham, Lakeview, 28.33. 4. Brette Graham, Lakeview, 28.36. 5. Bella Sallee, Unattached, 28.94. 6. Elizabeth Grandle, Molalla, 29.16. 9. Aubrey Love, Crook County, 30.22. Long Jump — 1. Taylor Chocek, Unattached, 4.89m. 2. Elizabeth Grandle, Molalla, 4.86m. 3. Erin Wanamaker, Redmond, 4.83m. 4. Sarah Phillips, Molalla, 4.65m. 5. Brette Graham, Lakeview, 4.59m. 6. Julia Ketcham, Lakeview, 4.40m. 22. Aubrey Love, Crook County, 3.51m. Javelin - 600g — 1. Katie Sandberg, Molalla, 31.54m.2. Julia Ketcham, Lakeview, 31.16m. 3. Taylor Chocek, Unattached, 28.90m. 4. Jasmyn Clark, Santiam, 28.89m. 5. Brette Graham, Lakeview, 25.56m. 6. Kirsten Crofoot, Santiam, 21.53m. 19. Aubrey Love, Crook County, 13.86m. 800 Meters — 1. Emily Jensen, McMinnville, 02:30.2. 2. Brette Graham, Lakeview, 02:32.9. 3. Julia Ketcham, Lakeview, 02:37.8. 4. Emily Cinnamon, McMinnville, 02:39.4. 5. Anna Cinnamon, McMinnville, 02:41.5. 6. Parker Rollins, McMinnville, 02:43.0. 7. Aubrey Love, Crook County, 02:44.3. Heptathlon Score — 1. Taylor Chocek, Unattached, 4217. 2. Brette Graham, Lakeview, 3461. 3. Julia Ketcham, Lakeview, 3215. 4. Elizabeth Grandle, Molalla, 3180. 5. Sarah Phillips, Molalla, 2968. 6. Kayla Morgan, Southwest Christian, 2823. 18. Aubrey Love, Crook County, 2080.